Thoughts and perspectives from the team. Public municipalities and or private water districts both possess a great deal of responsibility to the condition of their existing AWWA D100 water storage reservoirs. Whether your tank is large or small, all water storage tanks need to be periodically inspected and cleaned in order to provide good water quality for the community and help extend the overall life of the tank. A routine maintenance program should be in place to prevent your tank from becoming a liability as a result of unsafe water quality, structural steel corrosion, and even leaks which may lead to unplanned service interruptions. Unfortunately for older tanks, coatings repairs, topcoats or even complete recoats along with welding improvements (seal welding) are essential and will need to be addressed sooner rather than later. Years of interior and exterior coatings failures that go unnoticed could lead to steel plate pitting and structural steel deterioration. These issues need to be addressed immediately as they may be structurally unsound and pose a public safety concern. Dry Film Thickness (DFT) - DFT readings will be taken at random locations to measure the paint thickness. Coatings Systems are specifically designed to perform when applied within a range of DFT as specified by the coatings manufacture. Lead Based Paint Detection - If there is lead in the paint, all local, state & federal environmental laws & regulations must be followed. If there are heavy concentrations of lead or other heavy metals, the coatings & blast residue may be considered hazardous and full-containment may be required during blasting operation followed by proper disposal of material. Adhesion Test – Performed to test if the existing paint is sufficiently adhered to the substrate. Visual Inspection - Inspector will make note of areas experiencing coatings failures (delamination of coatings, rusting/ corrosion of steel surfaces, etc.). T BAILEY’s staff of experienced personnel (which includes in-house NACE Level III inspectors and certified welding inspectors) can help decipher the report and guide you in the planning and budgeting for the repair of your tank. Depending upon the results of the report, several recommendations might be made depending upon the tanks’ age, maintenance history, environmental conditions and water quality. Applying a coating over the existing coating system. A complete coatings remove and the application of a new coatings system specially chosen for your tank. Choosing the optimum coating system for your tank is essential to insure maximum life expectancy of the tank. 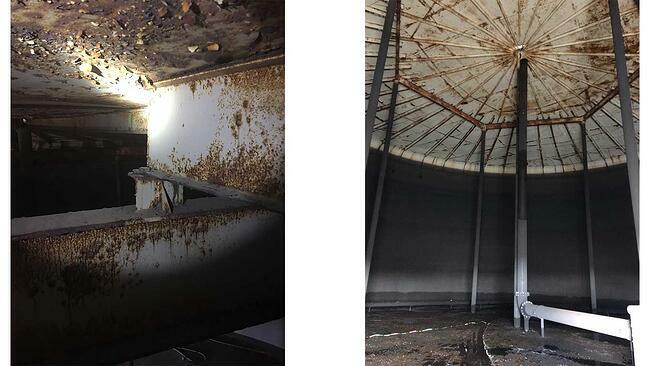 Internal corrosion of the underside of the roof structure is typical for all steel water tanks which are not seal welded. Even with proper surface preparation and new coatings application, roofs that are not seal welded will shows immediate signs of rust bleeding after the tank is returned to service; this is due to moisture condensation at the exposed metal surfaces above the rafters and/or at all roof plate lap joints. Several years ago, NSF 61 revised the definition of “potable water contact area of tanks” to include those surfaces where water can condense and fall back into the tank. 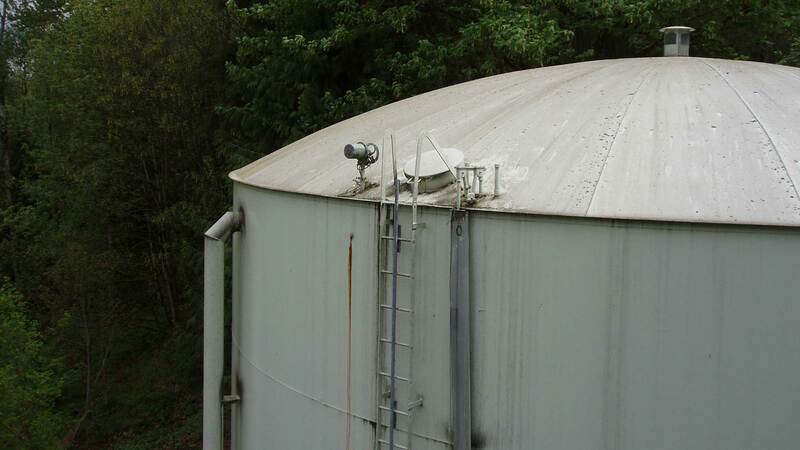 This revision prompted engineers to begin requiring water tanks to have a seal welded roof even though the tank standard, AWWA D100, did not require it. That in turn led the owners of water tanks to retrofit their existing water tanks with a seal welded roof. T BAILEY highly recommends seal welding the roof underside and interior support structure. Location - The tank’s proximity to adjacent structures and accessibility of the tank. Timing - How long the tank can be out of service and if there are any seasonal restrictions. Depending on specific project requirements, T BAILEY often cuts and removes steel panels (doorsheets) from the tank shell. This is done to assist our field crews and field painters in gaining access to the tank interior and under roof structure with a man lift for tank steel improvements and/or blasting and painting operations. If the tank is tall, T BAILEY will install painters plugs (couplings) which are strategically placed in and around the roof for the paint contactor to utilize swing staging (scaffolding suspended by cables) which will allow the coatings contractor to blast and coat the high and difficult to reach areas on the interior of the tank. Recoating and performing steel improvement work on steel water tanks is complex and requires strict adherence to the applicable codes and standards. It is critical that this work be completed by a certified, trained, and experienced contractor. 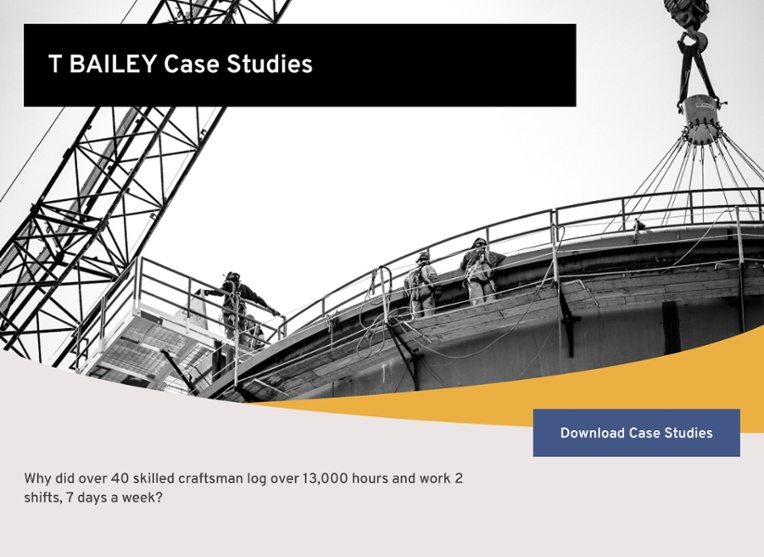 T BAILEY has the capability to fabricate, field erect, and coat new welded steel water tanks as well as retrofit and recoat existing water storage tanks. Our skilled field personnel have extensive experience working in all environments and being 100% self-sufficient. We’ll help you take the proper corrective actions to repair your water tank, saving you time and money while providing you with a quality end-product. Have You Considered Metalizing as a Solution for Your Coatings System Need? Have you wondered if it's important to select a welded steel tank company that owns its own industrial coatings division? Well, wonder no longer – the answer is it is very important! Here's why.